Starting with a blank canvas, we cleared and leveled the site, laid foundations and built the walls and stone terracing. We then laid the lawns and constructed all the flower beds. In a total of four phases, we also built stone terracing around the swimming pool, wet stone walls and the drive for this property near Henly in South Oxfordshire. We also created a cottage garden at the front of the house. These gardens appeared in an article featured in Homes and Gardens. Working closely with the customer and our garden designer, we created a patio, steps and two tiers of lawns to make the most of the sloping space available. We advised on the materials required, and designed and built all of the stone terracing, steps, drive and lawns for the developer on this project. 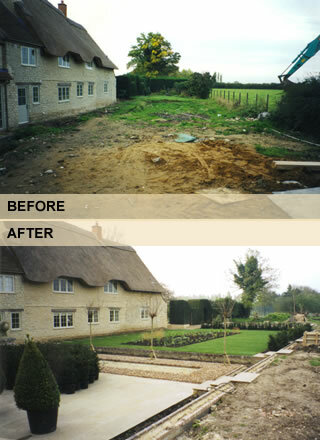 This garden in Boars Hill, Oxfordshire was constructed from a virgin site to the design and specification supplied by the client. The complete garden included terracing, gravel pathways, stone balustrades and lawn construction. A Japanese garden was also part of this project. We were briefed by the landlord of this rented property to clear the existing garden which had been neglected for several years. The aim was to create an easy to maintain garden. The garden was cleared, trees and shrubs pruned and a new terrace and lawn was laid. Finally a new garden shed was erected.